This November, the University of Belize (UB) held two major events that promoted innovation, creativity and entrepreneurship among its students. Open Day for the University of Belize (UB) is one of the most anticipated days on its calendar. This is where the leaders of the University, our staff and faculties and most importantly our students open our University in an effort to build a strong emotive connection with prospective students, their parents, stakeholders and the community-at-large. 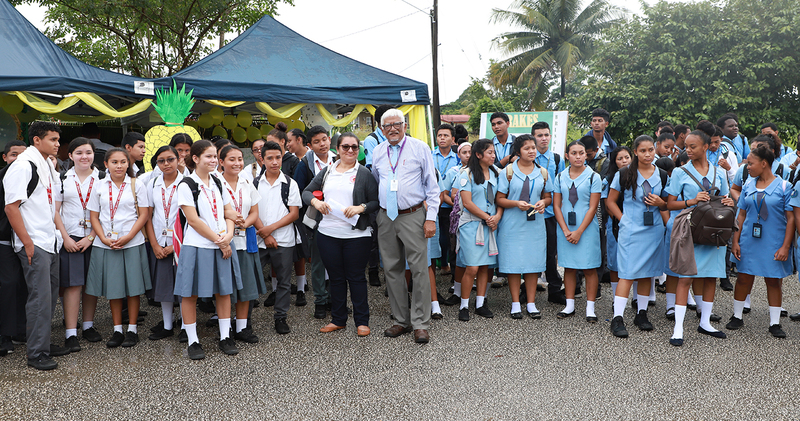 This year’s Open Day, held on November 21st at the Belmopan Campus – under the theme, “Empowering Inquiring Minds for Higher Education at UB,” – was no different, and it reaffirmed, once again, why UB is Belize’s national university. It demonstrated our students’ academic excellence, their entrepreneurial spirit and one of the strongest forces of the human mind – their curiosity. They were ably supported by Faculty and Staff. Equally important was the participation of many of the University’s valued partners. UB strongly believes its partnerships not only strengthen the common interests and missions of all, but also, by leveraging each other’s strengths, it contributes positively to Belize’s national development. Therefore, our partners participated in the Open Day, promoted their businesses or organizations and provided invaluable information on their services and careers in their industry. Once the Opening ceremonies concluded, the Open Day began and UB told its remarkable story. Below are highlights from the day. Once again, the Belmopan, Belize City and Toledo Marketing students joined the global community in celebrating Global Entrepreneurship Week, where in honor of this week, the Belize City marketing students hosted their 11th Annual Marketing Expo on the 14th of November, while the Belmopan marketing students held theirs in conjunction with the UB Belmopan Open Day held on the 21st of November. Students in Toledo had their expo on 15th of November where they displayed their efforts and creativity. These expos are practical assignments for marketing students as they allow students to put theory into practice. Each year, marketing students compete for prizes and prestige by developing a real-world marketing strategy for a possible new product. They must also create display booths to ‘sell’ their product in a simulated trade show environment to a panel of judges, who take on the role of potential buyers, and they evaluate students according to originality, creativity, customer service, attire, packaging and labeling. This often leads to clever, creative and sometimes unexpected results! • Deciding how to promote the product (advertising channels). The events are full of energy and excitement, with around 10 exhibits per expo on display each year. These events garner immense support from the Business Community, who assist with sponsorships for the winners, judging the students and are participants to the event.